Afif Safieh served as Palestinian General Delegate in London, Washington and Moscow from 1990 to 2009. During this time, he met and interacted with the leading figures of our times: from Yasser Arafat, John Major and Tony Blair; to Jimmy Carter, George W. Bush and Pope John Paul II. 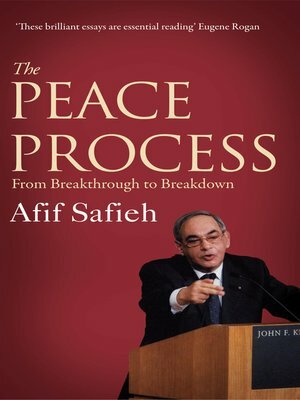 The Peace Process: From Breakthrough to Breakdown brings together Afif Safieh's articles, lectures and interviews from 1981, when he was a staff member in Yasser Arafat's Beirut office, to 2005, at the end of his mission in London, revealing the political and intellectual journey of one of Palestine's most skilled and distinguished diplomats. His writings, which centre on the Palestinian struggle for independence, are a testament to his vision and humanity and provide a unique map of Palestinian diplomacy over the last three decades.